Read Part 1 and Part 2 of this article detailing the Friday and Saturday services of the Jubilee celebrations. 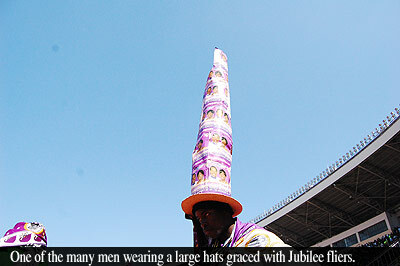 Loud shouts of joy were heard throughout the National sports stadium on Sunday, August 22, the final day of the Jubilee celebrations weekend, as the stadium was packed completely with many people arriving later and standing outside. The colors of the jubilee attire worn by attendees created a beautiful rainbow across the massive arena. The morning began with musical performances from various artists and church members, followed by a continuation of the presentations and speeches from different ZAOGA FIFMI ministries and departments which had began on Saturday afternoon. One very notable presentation from the “Go Quickly and Tell” women's ministry included a large crowd of hundreds of women dressed in Jubilee apparel, who testified of how God had changed their lives, and had turned them into beautiful, successful, admirable women. They sang a song in Shona saying “Muchiona takadai, dai, dai, ndiro ropa ra Jesu, hatina kuberekwa takadai.” (You see us as we are today, its (because of) the blood of Jesus. We were not born like this). The women testified using multiple languages in a theatrical-like format, with select individuals using improvisational dialogue to creatively tell stories of what God had done for them through the Go Quickly and Tell ministry. 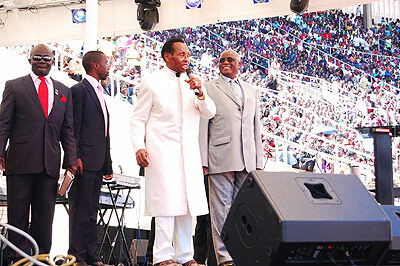 During the announcement of the live broadcast which was going to be on ZTV and Ezekiel TV, there was a sudden eruption of shouting as Apostles Dr. Ezekiel and Eunor Guti entered the stadium. It was the grandest of entrances, with vuvuzelas blowing and the crowd screaming and shouting. 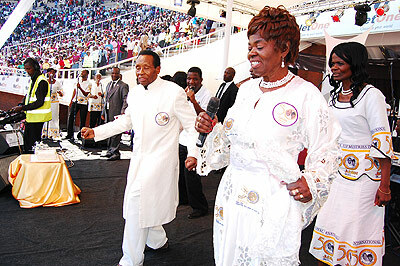 The arena was filled with music, dancing, and excitement, as the Apostles walked down the stadium's track on their way to their seating areas. Also entering together with the Apostles was the honorable Vice President John Landa Nkomo of Zimbabwe who later took the stage with a congratulatory speech, as well as a powerful word of exhortation from the Word of God. Vice President Nkomo was also celebrating his 75th birthday, and the crowd celebrated together with him in singing “Happy Birthday to you” led by Apostle Dr. Eunor Guti. Apostle Dr. EH Guti (Baba) stood up to preach following the vice president, sharing a message that would take the church to a new level of holiness and fear of God, in the next 50 years. To the leaders of the church, Baba spoke concerning faithfulness, teaching that there is no way to serve God without being transparent. “When you use money faithfully, and are honest before God and men, people will be glad to support the work of God. To all those who were listening, Baba spent much time on the topic of self-control, specifically controlling the flesh, and living to please God, and not people. Quoting Psalm 111 vs 10, and touching again on the same area as in his message the day before, Baba continued to emphasize that what has brought the church this far is the fear of God. “We're going to stand...and thank God together and agree that we will start these 50 years in fearing God. And God showed me that within (a) few years those fearing God, God is going to use them to bring more people to God. 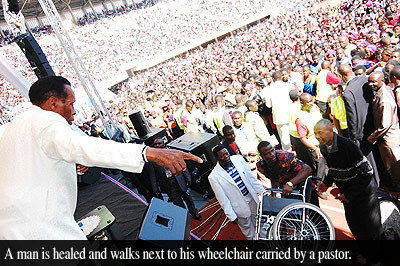 God is going to use some people. They're going to live holy lives. And then I say, few years to come we will see young people, young Ezekiels, we'll see God using them for the Kingdom of God. The celebrations could not end without a time of deliverance and salvation. As Baba pleaded with the many lost souls that stood in the arena, he explained that he could not allow the service to close until people were saved. 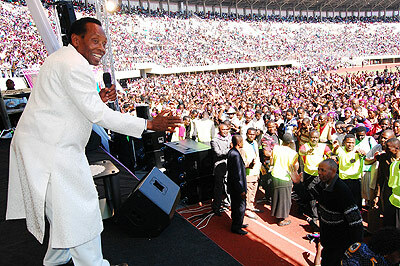 As people traveled down from the high stadium stands, the area near the stage became packed with many who came for prayer, in order to be saved. An estimated seven thousand people came and prayed the prayer of salvation that morning, and even more were added who came to join ZAOGA FIFMI, as well as others who came for their healing and deliverance. Not enough time was available to truly see the vastness of the work that has been done through ZAOGA FIFMI. The Jubilee celebrations weekend was above and beyond expectations. People from all over the world traveled to Harare, Zimbabwe, many traveling into Africa for the first time in their lives in order to witness the mighty works of God through the ministry. Because of the great number of miracles, there were numerous untold testimonies, which although unheard by the masses, will forever build up the faith of those who experienced them. The entire conference was put together by a committee of under 150 people, who worked tirelessly to make the event happen. 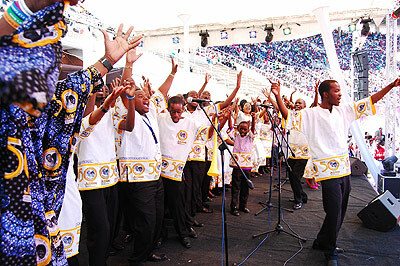 As Apostle Dr. EH Guti emphasized, Jubilee did not end with the Jubilee celebrations weekend. Jubilee is continuing throughout the remainder of the year 2010, with liberty and victory still permeating into lives of those who will continue to believe and fear God, and receive all that He has prepared for His people. To close the weekend celebrations, Apostle Dr. EH Guti lifted up his hands, and prayed a blessing upon the people. It would be hours before the arena was cleared, as people remained behind to fellowship in the same love that brought ZAOGA FIFMI to its 50th/sup> year, celebrating the grace of God which endures forever.